Fighting between militia groups killed about 300 people and uprooted 100,000 in Central African Republic this month, the worst bout of displacements since 2013. 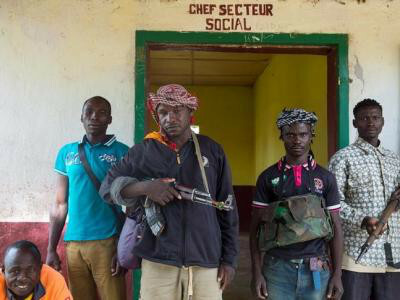 Civilians have been the first victims of a conflict which started when a mainly Muslim Seleka rebel alliance ousted President Francois Bozize four years ago, sparking reprisals from Christian militias. * One in five Central Africans is currently displaced and nearly half a million of these have sought refuge outside the country. * Most Central African refugees are now in camps in Cameroon, Chad, the Democratic Republic of Congo and Congo Republic. Cameroon hosts over half of all Central African refugees. * Around 2.2 million people, around half the population, need humanitarian assistance, according to the United Nations. * One in seven children will die before they reach they turn five, and a third of children are out of school, according to UNICEF. * 68% of girls are married before turning 18. * Despite being rich in diamonds and gold, Central African Republic is one of the poorest countries in the world and ranks last out of 188 countries in terms of human development.